This week's challenge at A Blog Named Hero is kissing one stamp against another. They're such nice people at A Blog Named Hero - they picked out my card as one of 5 from the last challenge for special mention, and I get a Heroine blog badge. Yay!! Love the color-scheme and the choice of circles and bubbles. The kissing really enhances the image. This is so cute! I love the shape of the card, almost reminds me of a onsie! Love the circle/bubbles!!! 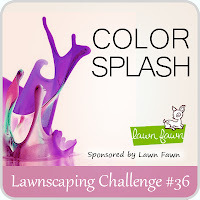 Thanks so much for joining us at Lawnscaping! This is wonderful! I love it so! Thanks so much for joining us at Lawnscaping! This is so cute! Those dots look awesome! Thanks for playing along with us at A Blog Named Hero!! Darling design, Shirley-bee! I love the pop of teal circles!Awesome stamping! So glad that you join the fun with us at Lawnscaping! Congrats on earning your new badge of Heroine over ABNH!! Way to go, girl! Love your clean card. Those kissed circles are so cool. Thanks for joining us at A Blog Named Hero. This is so cute! Great use of the circles! Thanks for joining us at A Blog Named Hero and Lawnscaping! Such a fun card!!!! love those circles!!! great job!